Optimized standardized cell culture techniques and analytical measuring systems building on this, have to keep up with future-oriented therapeutic concepts during rapid biotechnological developments. Therefore, the Main Department of Medical Biotechnology is developing innovative cell culture systems and testing methods for different fields of stem cell research and nanobiotechnology. In the field of stem cells, the availability of material in constant quality is essential. Therefore, the division is developing platforms to optimize the efficiency and reproducibility of the cultivating processes. Another focus lies in the development and testing of new application systems which should help to cross biological barriers, e. g. the blood-brain barrier or the gastro-intestinal barrier. Nanoparticles loaded with drugs are tested in transport and exposition studies; they have anchor molecules on the surface which are able to recognize certain structures at the barrier and transport effective ingredients selectively to their target location. For this purpose, suitable barrier models are developed within the main department. We also are deploying newly developed cell culture systems and testing procedures in the field of nanotoxicology. The development of these new transportation methods for drugs as well as the examination of the chances and risks of nanoparticles are supported by different national and international joint projects. In addition to this, future-oriented platforms for collecting, preparing, preserving and distributing bioreagents and clinical samples for worldwide networks are developed within the main department. This includes optimized processes for sample reprocessing and their cryopreservation as well as the production of bioreagents. The main department provides new technology platforms for the development and clinical testing of vaccines and new therapies, e. g. the production of virus stocks within a fully automated system. Another task of the main department is the operation of a range of different biobanks. For a German-African joint project concerning research on the Staphylococcus aureus pathogen, strains of these pathogens are collected and provided to science. Scientists in Germany and Africa want to find out how widespread and resistant these pathogens are on the African continent and what can be done to prevent this deadly threat. 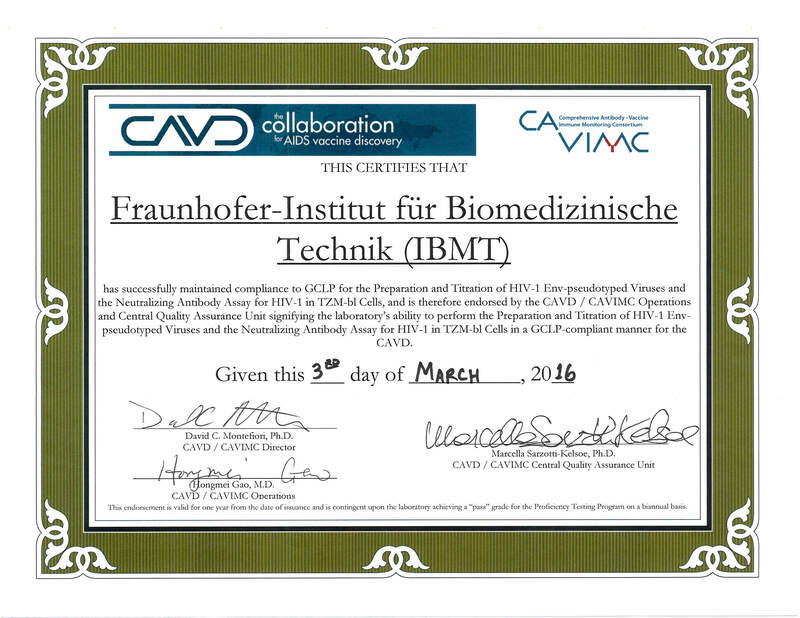 The human related branch of the German Environmental Specimen Bank (ESB) is another important biobank operated by Fraunhofer IBMT. 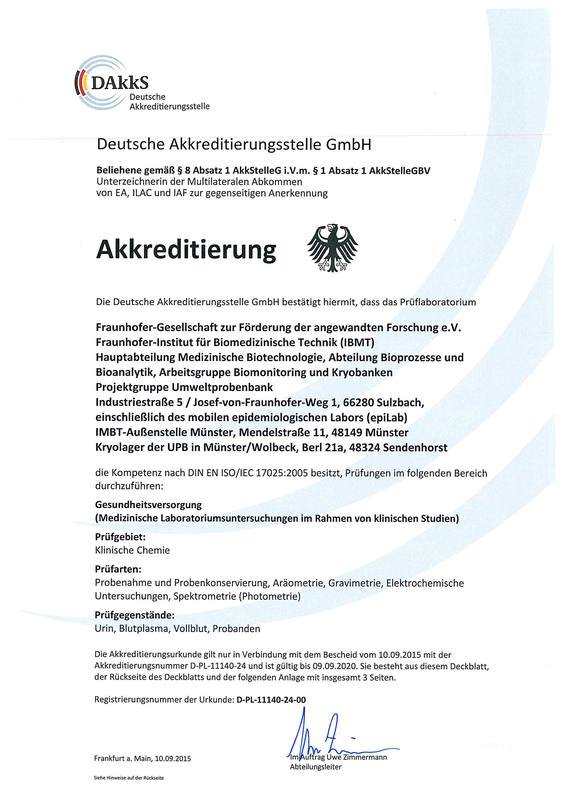 It is an archive of human samples which forms a central element of Germany´s program for risk analysis of contaminants in humans, the so called Human-Biomonitoring. Our seas, oceans and waters are a valuable asset that needs to be explored and to protected. Fraunhofer IBMT deals in many fields with these lifelines, be it with algae as the basis for stem cell cultivation or the detection of minute nano amounts in environmental samples.